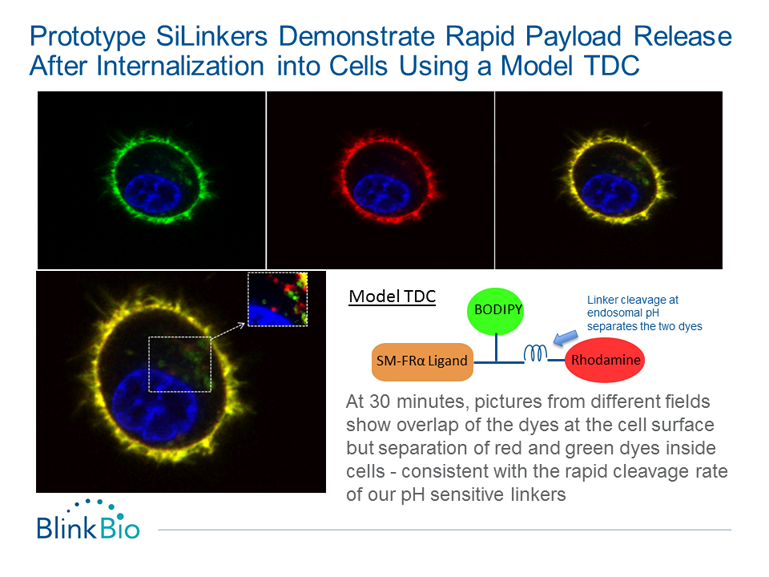 At BlinkBio we have discovered and developed novel, tunable linkers based upon proprietary disilylether-based chemistries that offer significant improvements over contemporary linker systems. They are designed to rapidly and completely release payloads in the modestly acidic conditions found within cancer cells (endosomal/lysosomal compartment) and in other hypoxic regions of the tumor microenvironment, while being stable at physiological pH and in human plasma. The released payloads are silanol adducts which generally results in an improvement in payload permeability compared to the parent payload molecule. We have validated the performance of our SiLinkers using model systems in the test tube, in cells and in mouse anti-tumor models. The differentiation of our linker system hinges on the exquisite and tunable sensitivity of the linkers to cleavage under modestly acidic conditions such as those that might be encountered in the endosomal and lysosomal compartments of a cell and in the acidic microenvironment of solid tumors. SiLinkers exhibit good stability at 37°C at physiological pH7.4 (in buffer and human or rodent plasma) but show rapid hydrolysis at pH ~5.0 to 6.5 . We have designed and characterized a variety of SiLinkers with differentiated hydrolysis profiles. 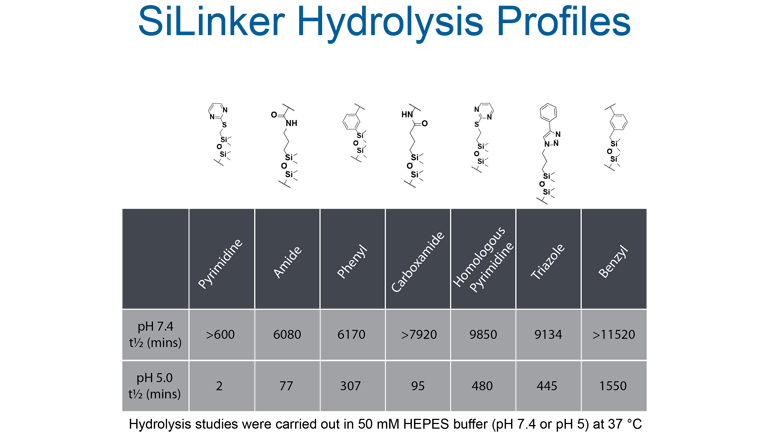 The half-lives of these SiLinkers range from 2 min to 25 hours at pH 5.0 and from >10 hours to > 8 days at pH 7.4. SiLinkers which hydrolyze rapidly at pH 5 infer the ability for endosomal release which can be important for receptors that recycle to the cell surface as well as for uniform release of payloads inside the cell. SiLinkers that hydrolyze slowly can be utilized for receptors that are trafficked directly to the lysosome. We have demonstrated that model TDCs can bind to cells, internalize and then release payload in the endosomal compartment. To do this we constructed a TDC comprising a folic acid ligand with two fluorescent dyes (BODIPY and Rhodamine) positioned on either side of a SiLinker. As such we would expect to see precise overlap of images for an intact TDC and separation into two components – as a result of intracellular trafficking, after cleavage of the SiLinker following addition of the model TDC to cells overexpressing the folic acid receptor. The figure below summarizes the results confirming the expected performance of our model TDC.